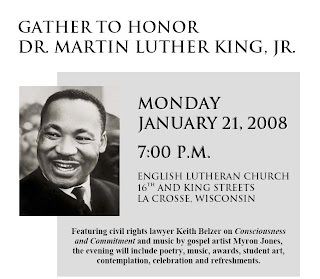 Please plan to attend the La Crosse community celebration of the life and dream of Dr. Martin Luther King, Jr. and help us spread the word by downloading the poster (right click on the graphic and save the .pdf file to your computer). If you prefer a .doc, right click and save this link. A community celebration honoring the life and dream of Dr. Martin Luther King, Jr. will be held at 7 p.m. on Monday, January 21 at English Lutheran Church at 16th and King Streets. Co-sponsored by several area organizations, the event will feature gospel artist, Myron Jones, and local attorney, Keith Belzer, who will discuss "Consciousness and Commitment." The program will include a multimedia presentation, music, and poetry and a display of art by area students. The first annual Martin Luther King Leadership Award will be presented. A reception with refreshments will follow the program. This event is FREE and OPEN TO ALL. Non-perishable food items will be collected for area food pantries. For more information, please call Curtis Miller, Jubilee Center, 782-1394 or Pastor Mark Solyst, English Lutheran Church, 784-9335. Co-sponsors: AmeriCorps, English Lutheran Church, Franciscan-Skemp Foundation, Gundersen Lutheran Medical Foundation, Jubilee Center for Justice and Peace, La Crosse Interfaith Justice and Peace Coalition, Onalaska United Methodist Church, NAACP- La Crosse Branch, UW-La Crosse, Western Technical College, YWCA, Coulee Progressives. Plan to attend and make a commitment to work in our community to realize Dr. King's dream.